Entrance Hall: central spacious hall with a tiled floor and staircase to the first floor. Shower room: accessed off the main hall. Contains a hand basin, WC and a walk-in shower. Sitting room: lovely spacious room with glazed doors opening out to the terrace. There is a feature beamed brick fireplace housing a wood-burning stove, large rug covering wooden floorboards, two large comfy sofas, two armchairs, large ottoman, occasional tables and lamps and a music system. TV room: relaxed room with two sofas, two armchairs and a large TV with full Sky package, Sonos system, DVD player and a good selection of books and games. Kitchen/Breakfast room: fabulous light and spacious extension, fully glazed along the garden side with two sets of doors opening onto the terrace and an open working fireplace with logs provided throughout your stay. There's a superb cream painted kitchen which is well-equipped to cater for large groups of family and friends, with two integral Bosch electric ovens, large ceramic hob, two integral fridges, integral dishwasher, large central island, Sony bluetooth speaker and a spacious larder cupboard. There's plenty of space for dining at the large wooden table with ten matching chairs. This is a lovely room throughout throughout the year with underfloor heating and the open fire making it warm and inviting in the winter, whilst in the summer the glazed doors can be be left open to enjoy the private garden. Utility room: contains a second fridge/freezer, washing machine, tumble dryer and back door. Accessed from here is a cloakroom: WC and hand basin. The staircase is not steep and has a bannister. At the top of the stairs bedroom 4 may be found along its own stretch of landing, with bedrooms 1, 2 and 3 all along the main landing. Bedroom 1: Stunning light and airy master bedroom with a full height beamed ceiling overlooking the gardens to the front and side. There is an extremely comfortable super king-size bed, bedside chests and lamps, full-length mirror, chest of drawers and a large wardrobe. En-suite bathroom: has a bath, separate walk-in shower, twin hand basin, WC and a heated towel rail. Bedroom 2: lovely room with full-size twin beds, bedside tables and lamps, radio, wardrobe and a wicker chair. Family bathroom: bath with overhead shower, hand basin and WC. Bedroom 3: has a super king-size bed and interlined curtains, bedside tables and lamps, chest of drawers with mirror, wardrobe, wicker chair. Bedroom 4: Attractive room with a pitched ceiling and twin beds (painted blue), bedside tables and lamps, chest of drawers. 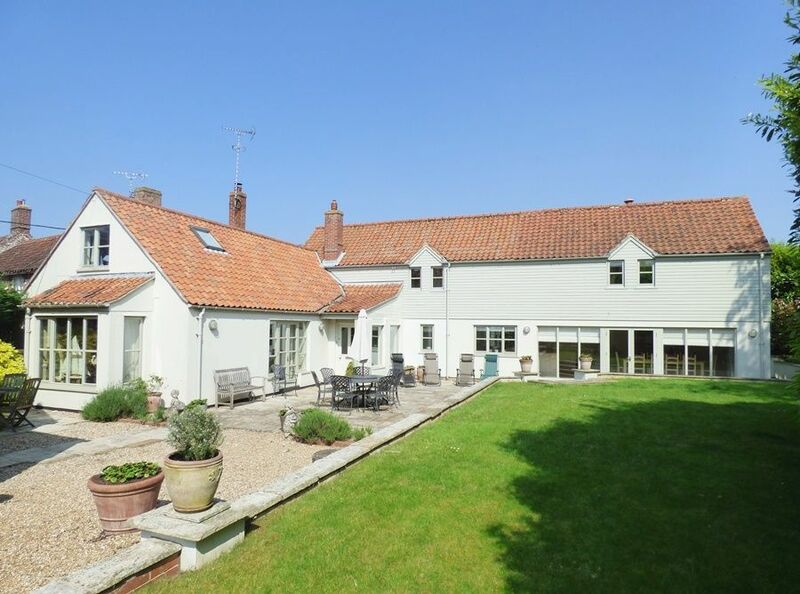 Walnut Pastures is located along the no-through Hall Lane in the heart of Thornham. There is a solid wooden gate leading into a large shingled parking space for several cars. From here there is a path through to the house. Please note that the building above the garage and the separate annexe in the grounds are owned by the same owner as the main house, but not included in this rental. They will not be inhabited whilst guests are in residence.